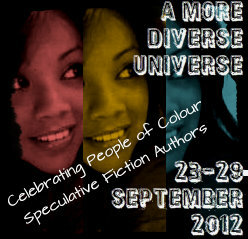 Today is the start of the A More Diverse Universe reading tour! To kick us off in style, Hiromi Goto has written a wonderful piece on why diversity in fantasy and science fiction is so important (quoted above). Goto is the author of Half-World, which as you can see on the schedule below, Jill at Fizzy Thoughts is reviewing today! She's also the author of Darkest Light, which Buried in Print will be reviewing on Wednesday. And, as you can see below, the breadth of authors we're all reading is astounding. It's a vast array of different cultures, world views, traditions, and characters, and I'm so excited to delve in and see what you all have to say about each one. Without further ado, here is the master schedule. I will update it with permalinks (hopefully) at the end of each day so that it can be a resource for everyone going forward. Also, if you want to chat about this event on Twitter, our hashtag is #diversiverse. NOTE: We have become aware that some participants never received our email notification of assigned dates. If you signed up for the tour and never got an email (I suspect it went to your spam folder), then please look below for your assigned date. If that date no longer works for you, please contact me with a couple of dates that would work better. If you signed up for the event and do NOT see your name on this list, please contact me, too, with the book you chose to review and the dates that you would be available to review it. I never got a notice and I am not on your schedule. I would like to review Redemption in Indigo by Karen Lord. I also wrote a general blog about fantasy by people, discussing the six books I have read and reviewed this year. Would you like to include it? Hi Marilyn, I'm so sorry your sign-up didn't come through on the form. I don't really know how to contact you to set up a date for your review, so please either respond here or email me at booklustblogger AT gmail DOT com. What an awesome project! I'm on the lookout for books for a friend, and I think I'll be finding some good suggestions here. Thanks for putting this together. Thanks for being an active observer! I'm overwhelmed by the excitement, too! So great! Thank you for organizing this! It's amazing how many people are participating. It really is! I am excited to see how the week goes. Hi, Aarti. I'm so thrilled to see a master schedule, which I've linked to with the button on my blog's sidebar. If it matters, my post for the 29th is Kobo Abe's Woman In The Dunes. It was a fascinating read! Thanks for organizing this so beautifully! Thanks for participating! I'll update accordingly, and thanks for linking to us :-) SO GLAD you loved your book! LOVE that you've put all these together in one post. Haha, that may be more laziness than anything else, but I think it's much more powerful to see all 100 people together in one list than separated daily. Hi Aarti, thanks so much for pulling this all together! What a great list of links! I finally have picked my book for Wednesday-- I'll be looking at Justice and Her Brothers, by Virginia Hamilton. Great, I'll update accordingly - thanks for letting me know. Aarti ~This looks amazing. You have done a wonderful job putting this together. Love it!!! Wonderful list! Makes it so easy to visit all, if I can. Having Mondays off is great for book blogging, but these tours and hops tend to interfere with my chore list for the day! I posted my review a little later in the morning today than I had planned, but hope it was OK for all but the real earlybirds. Hi Aarti, I changed my book to Parable of the Sower. I did the old "see which ones takes" and tried both and I can't put down PotS. Hope that's okay! This is my piece. Thank you again SO MUCH for organizing and facilitating this; it's amazing. I don't know if it's too late and technically, my review was posted on September 19th, but here is a review of N.K. Jemisin's The Killing Moon. I found out about this blog tour too late but I've been having these thoughts going on inside my own head for a while. Actually, Jemisin and Nnedi Okorafor gave me the push to read more diverse fantasy. And so far, none of their books have disappointed. I hope there will be another week (maybe even an entire month!) devoted to diverse writers and characters in fantasy literature. Thanks for hosting this! I hope you do it again! Are you doing something like this for 2013? I'd like in. Yes, we'll be doing it again, but haven't settled on dates yet.